The Sewing Space offers a relaxed atmosphere where you can have space to sew your creations without taking up a room in your home. Enjoy the camaraderie of like-minded individuals, expert tips, and hot drinks. Sewing classes will also be available starting in January. Each class is a 6-week course with one 90-minute session per week. Class fee: $150 plus $35 for materials. Contact The Sewing Space for more information. 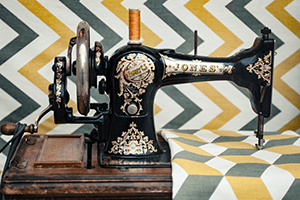 My love affair with sewing began when I was a child watching my mother cut fabric at the dining room table. I can still hear the sound of her sewing shears. She made all of my school clothes and used her tailoring skills to make my winter coats. Her sewing machine had a knee lever so that my feet didn’t need to reach a foot pedal. She started by teaching me to put a hem in muslin tea towels and then I graduated to making (and designing) clothes for my dolls. I loved playing with my paper dolls, which at that time, were usually movie stars like Debbie Reynolds and Elizabeth Taylor. I designed the most fabulous gowns for them and am still in awe when I see one of MY designs on Angelina Jolie as she walks on the Red Carpet! In the 6th Grade, Home Economics was part of the curriculum, and we were taught how to sew an apron. Then in the 7th Grade, we advanced to using a pattern to make a blouse and a skirt. By the time I was in high school, I was making most of my clothes. My Home Ec teacher was always sort of miffed because my mother had taught me so many little shortcuts and tricks that my skill level was far above most of my classmates—and the instructor! That was the beginning! Over the next 50 (yes, 50!!!) years I made clothes for myself, my sons, and my grandchildren. I worked in an alterations shop and taught Wardrobe Planning and Figure Analysis in a fabric shop. I completed a course on Pattern Drafting and Fashion Design. I was a military wife, and so each time my husband was reassigned, the new house got a makeover with slipcovers and draperies. Both of my sons have quilts I’ve made them and my grandchildren each have at least one quilt I’ve made. A friend wanted to learn to quilt, but the only time we saw each other was on camping trips. Yep, you guessed it—I taught her to sew and quilt at the campsite picnic table. Most recently, I taught Basic Sewing and more advanced classes for County Parks and Recreation in Chesterfield, Virginia. Now I’m ready to begin a new chapter right here in Atchison, Kansas! I hope you’ll join me. I promise the journey will be FUN!